Set a medium sized bowl in the freezer- you will use this later to whip the cream. 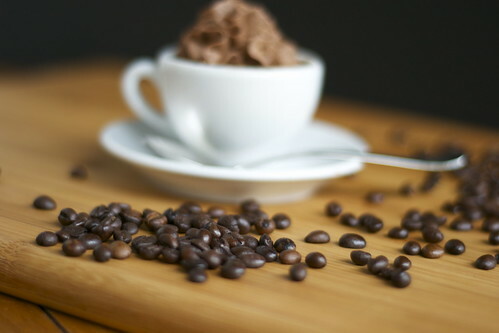 In a medium sized bowl set over a saucepan of simmering water, melt the chocolate, butter, and espresso powder. Remove from heat and allow to cool for a few minutes, then whisk in the two egg yolks. Set in the refrigerator. In yet another medium sized bowl, whip the two egg whites and cream of tartar on medium speed until foamy. Gradually add two tablespoons of the sugar, increase the speed of the mixer, and continue to beat until stiff peaks form, yet the whites are still glossy and not dry. Set aside. Take the bowl out of the freezer, and in it whip the heavy cream, vanilla, and remaining 1 tablespoon of sugar until soft peaks form. Remove the chocolate mixture from the fridge and stir in a couple of spoonfuls of the beaten egg whites to lighten it, and then gently but thoroughly fold in the rest. Fold in the whipping cream. Don’t stir, fold! Spoon into individual serving glasses, eat right away, or cover and refrigerate. Makes 6 servings. Fact: I spilled hundreds of coffee beans on my floor in the taking of this photo. It was actually hilarious. Eat some chocolate today. It’s good for you. Mmm that looks and sounds so good! I like the way you piped it too. Very pretty. Normally, I am not a fan of milk chocolate mousses, but this looks absolutely delicious! I will definitely be making it. Usually, neither am I! But the espresso adds such a nice deep kick, it’s something special! I too love how you piped it, very beautiful pictures. Oh…look…soo…..GOOD…..I really love chocolate mousse THAT much. Holy mother of god. I need that in my life! Wow thank you! I would love to! It looks so chic! I love it! Nothing beats silky smooth chocolate mousse in my book. giiiirrrrl! this looks gorgeous! i’m so glad you started this space. Bahhhh coming from you, that means more than anyone can imagine! Thank you thank you!!! Just discovered your blog–this looks delicious. I could eat chocolate mousse pretty much all the time! These photos are gorgeous and that mousse looks absolutely amazing! Thanks for sharing the recipe! Found your amazing photos on FoodGawker and I am so glad I did. 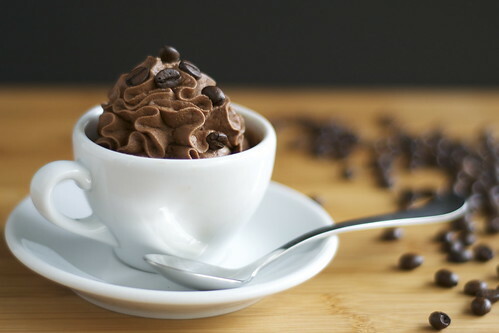 Can’t wait to try this recipe…and since no one else in my house likes espresso I will get to eat it all!!! This look incredible! 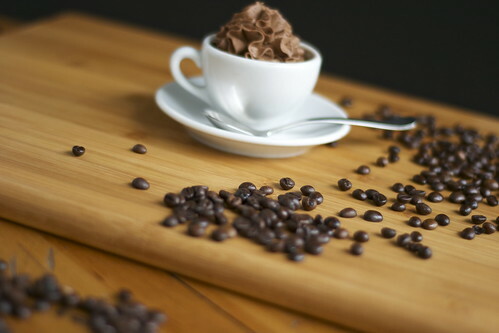 Chocolate and coffee is a match made in heaven, definitely making this soon! Woohoo!! Spread the chocolate love worldwide!! 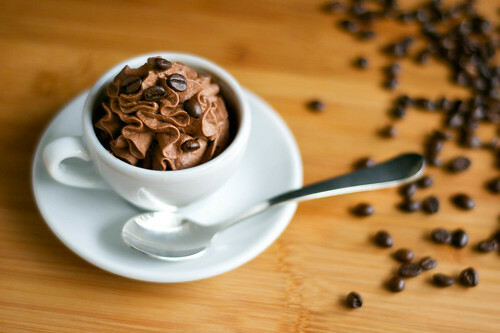 Looks lovely and you had me until I read, in the midst of all the real ingredients, instant espresso powder…. I intended to let it pass and move on when I read the comment about spilling all the real coffee beans. Just seems curious to me to go to all the effort with real eggs and whipping cream instead of from a can and then just using instant coffee. Why not use carob instead of chocolate? i was just attempting to make an expresso with my new expresso machine…failed. this looks so damn good it will haunt me all day. I’m going to send it to my husband and see if he will make some! This looks absolutely delicious I’ll have to try this. Great recipe, looks very inviting. I love this post….!!! Must try this recipe. after hard working day i need this kind of recipe to relax myself in the kitchen with good food. I would sure try in my kitchen i am dam sure that it not only looks but also testy at the same time. I make pretty good coffee already, but this is heaven. where does one get espresso powder in a little town? 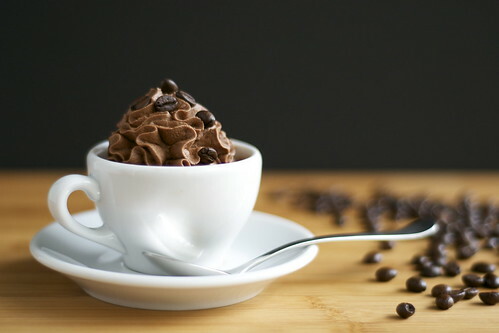 Pingback: Espresso Chocolate Mousse « Fünf Gemuse. Looks amazing! Chocolate paired with anything is great, and coffee needs no embellishment really, but this must be delicious. Great photos too!